I just got a call from my Mom4RMarines contact saying that they need 8 baby boy, and 7 baby girl quilts. Maybe I better rethink the lavender and do blue instead. What do ya think? Since I tend to do girly pinkish prints, I better get digging into my stash for blues. Good thing I've got a nice stash of about 10 string quilts all set and ready to go. Guess where I'll be for the next few days? In my sewing room of course. I'll post my progress when I get them all finished. These are all going to families at Camp Lejeune, NC. and their new little wee ones just born! I like to make my blocks 5 1/2 inches and set them 6 x 6 for a total of 36 blocks. Mine are small. Just the right size for a baby quilt. But there are no rules. Just fun. Join US? Well I'm very happy to be here! I pieced my first 36 string blocks last night, will wait until tomorrow night at my small group to peel off the backing (FINALLY, a good use for all the phone books!) plus show them off. Now I have some very basic and elementary questions: What, exactly, is the challenge? 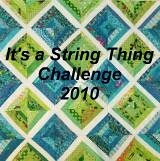 Are we to make a string quilt each month in the month's theme for Mom4RMarines or a local charity? Is there a list somewhere of the monthly themes? I'm in Texas and active in a guild so I do have outlets for service quilts. I'm looking forward to being an active member, as I will need to live 400 years to use up all my fabric.